So what would you do if a portion of your home town was seized by the government, walled off, and then turned into a maximum security prison? Probably not much, you may send a letter to you congressman, maybe join a protest for a while, and eventually go home and eat Cheetos. Good thing Bruce Wayne is not you. He actually joins politics to try and get this place taken down. 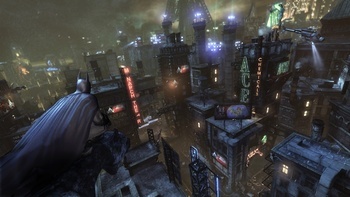 Bruce does not agree with Arkham City and wants it shut down. Too bad he gets gets tossed into the place himself as a result of this. Welcome to the start of Batman Arkham City my friends; the night has started poorly and it is not about to get any better.